This week we shift our focus to Prepared Food. The term “attic salt” is an old British term meaning “refined wit.” We have crafted each sandwich in a witty & refined way, each with a dash of our signature black salt. All sandwiches are just $10. Our dog is named Panini (yes, that means sandwiches). Hence Attic Salt is born. Mess Hall is San Diego’s one-of-kind, market only-sourced restaurant helmed by Blue Bridge Executive Chef Tim Kolanko and Chef de Cuisine Collin Murray. Nearly all of the items on the ever-changing menu will be sourced daily from the artisans within the market, and every dish will have beer, wine and cocktail pairings by Mess Hall’s General Manager and Sommelier Tami Wong. Sundays will be special at Mess Hall, from brunch with a Bloody Mary cart to Sunday Roast, a three-course dinner highlighting roasted meat and fish from the wood-fired oven. At Fully Loaded, we produce 100% raw, organic, cold-pressed juice recipes, each 16-ounce bottle of which contains the juice of 3-5 pounds of organic fruits and vegetables sourced from local farmers. Unlike other juicing processes, cold-pressed juice retains the vitamins, enzymes, and trace minerals of the constituent ingredients. All of the valuable nutrition of the fruits and vegetables stay intact, making for pure, vibrant-colored juice recipes that are exceptionally healthy and taste amazing! Fully Loaded juice has no pulp; upon entering the body, all those vital vitamins and mighty minerals go directly into your cells for an immediate, energizing impact. So drink Fully Loaded and feel the difference! Stuffed! 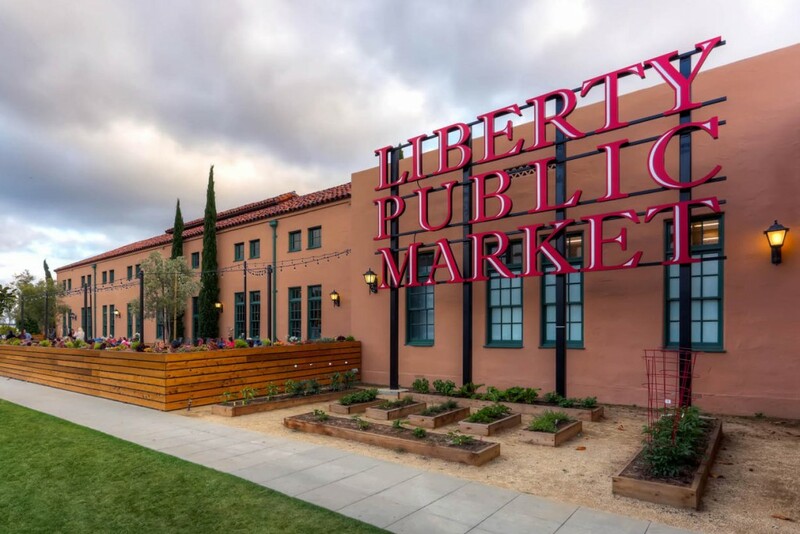 first rolled onto the streets of San Diego as a gourmet food truck and has since evolved into a permanent fixture inside Liberty Public Market. The modern comfort food concept is known for their decadent grass-fed burgers stuffed with a variety of cheeses, crunchy tater tots topped with housemade cajun seasoning and deep fried oreos. Their menu has expanded beyond burgers and tots to include sandwiches, build-your-own mac n’ cheese, french fries, fried onion straws and ice cream floats. Now serving breakfast Friday through Sunday from 9-11am offering breakfast sandwiches, breakfast burgers and more. Stuffed! is on a mission to create elevated, hand-crafted versions of the classics with a hint of nostalgia in every bite! Scooped by MooTime Creamery at Liberty Public Market is a smaller version of Blue Bridge Hospitality’s MooTime Creamery in Coronado. Scooped serves America’s favorite dessert — ice cream — in handcrafted, unique nostalgic treats and an assortment of ice cream flavors including silly vanilla, coffee, brownie batter and sorbets in passion fruit and prickly pear.